The Lion of Lucknow had several mystical experiences as a young child. Madhukar’s guru always desired to "see God." A family man from the Western Punjab, he travelled across India soliciting the help of sages and gurus. In 1944 Poonjaji's search ended in the silent gaze of his guru Sri Ramana Maharshi at the feet of the sacred mountain Arunachala. With absolute resolve, Poonjaji dedicated his life to the recognition of freedom and peace. He pointed to where true fulfillment is, where truth is, where the Buddha is, where God is. A true "Papa" in the hearts of many, he was lovingly called Papaji. Sri H.W.L. Poonja left his body in 1997 in Lucknow, India, at the age of 86. Self is what gives breath to Life. You need not search for It, It is Here. You are That through which you would search. You are what you are looking for! 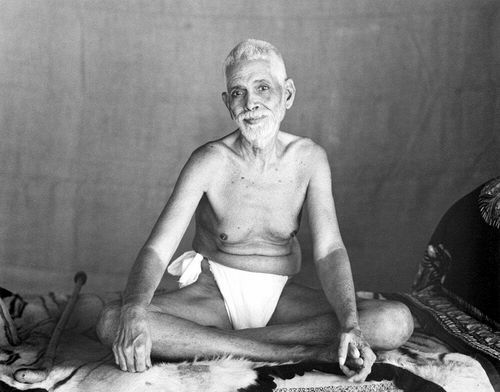 Realizing the Self at the age of 16, Bhagavan Sri Ramana Maharshi is one of India's most revered sages. Sri Ramana lived his life of self-recognition at the feet of India's holy mountain, Arunachala. Madhukar’s guru Papaji (Sri H.W.L. Poonja) met him here in 1944. An uncountable number of spiritual seekers has received Sri Ramana’s transmission and essential teaching - who we are is boundless consciousness, completely whole, and totally free. To realize our true self, Sri Ramana's guidance is pure and simple: Be still. Be absolutely still. There is neither creation nor destruction, neither destiny nor free will, neither a way nor awakening. That is the final truth. Join our in-depth silent retreat at the feet of Arunachala!